James Connolly, one of the leaders of the 1916 Easter Rising, was born in Edinburgh to Irish parents in 1868. He became involved in socialist politics in Edinburgh in the 1890s before moving to Dublin in 1895. In April 1903 Connolly returned to his Edinburgh birthplace to plan a speaking tour of Scotland. During this extended visit Connolly played a key role in the establishment of the Socialist Labour Party, a new organization similar in its political outlook to the American party of the same name founded by Daniel De Leon. Evidence of Connolly’s activities in Edinburgh at this time can be found in the Tait collection’s extensive holdings of political papers. 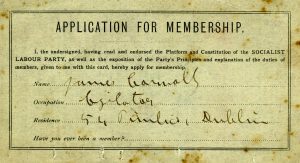 Connolly’s membership card for the new political party is included in the boxes of material relating to the Socialist Labour Party. His address is given as Pimlico, Dublin, his home before departing for the United States in September 1903. Connolly’s support for the new party is also noted in the minutes of the Edinburgh Branch, which are also present in the collection. James Connolly’s contribution to the international socialist movement is also recorded in our collection of left-wing newspapers such as The Socialist and Workers Republic and the pamphlets which were used to spread political ideas to workers around the world. 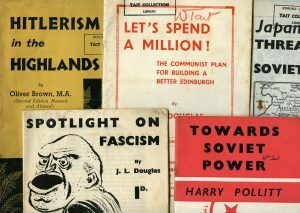 The Tait collection includes a large selection of left-wing political pamphlets from the first half of the twentieth century.